My firm constantly evaluates industry trends and happenings to formulate what we term our Industry Overview. Although a constant process involving hypothesis, research, and re-evaluation, we center our thinking annually to ensure we properly debate, debunk, and determine where our industry is moving. As part of the process, our staff does a lot of research. Some of the research focuses on themes we hear multiple times over in client strategic planning sessions. One such theme was the right sizing of community banks' funding sources. 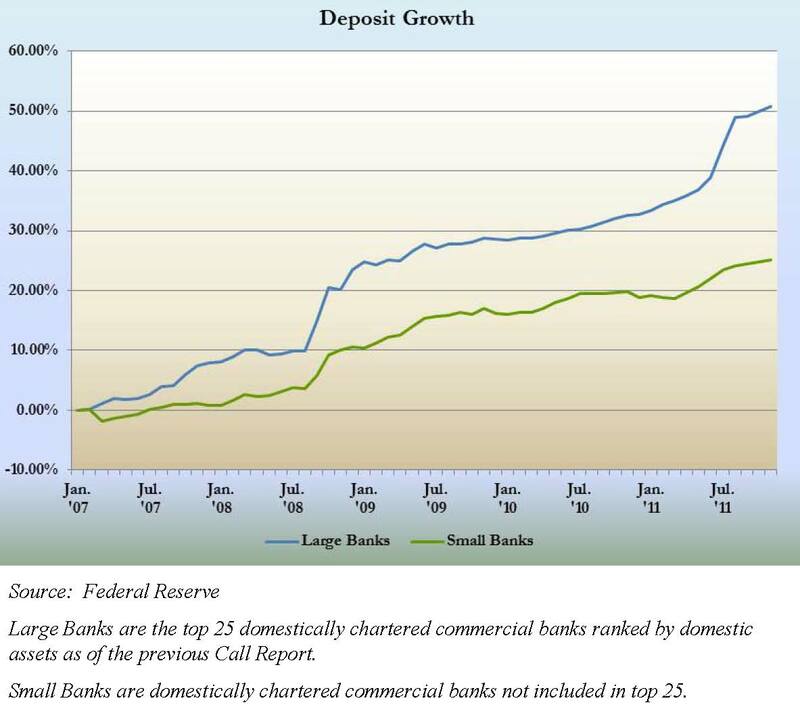 Since the dawn of the financial crisis in 2007, loan demand has fallen off of the cliff, and therefore community banks did not need their historically high amount of CD funding. As a result, we dropped rates to such a level that it wasn't attractive to traditional CD customers and they began parking money in liquid savings vehicles, such as the money market account. Our deposit coffers swelled like a puffer fish. In many strategy sessions, senior management teams began to feel pretty good about their efforts in attracting core deposits, and how they are beating the big banks in deposit gathering. Not so fast. 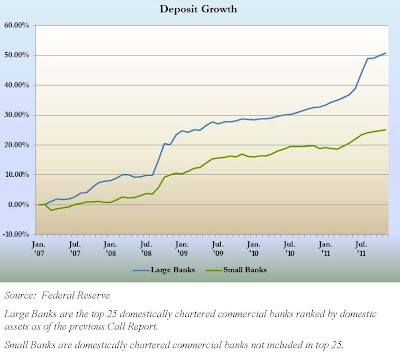 As the chart below shows, although community FI deposit growth has been quite robust, with an emphasis on core deposit growth, the big banks (defined as top 25 US banks) are outpacing us. This is exemplified by Bank of New York/Mellon charging their largest depositors negative interest for the convenience of parking their cash in BNY's vaults. Another theme we hear in community FI strategic planning sessions is how much better we are at serving small businesses. We provide access to decision makers, custom loan structures, and better service than our larger brethren, so the discussion goes. But the chart below from recent Small Business Administration research, although using 2009 data, demonstrates a trend worth noting. 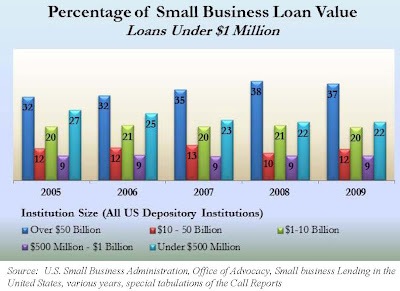 In 2005, banks with greater than $50B in total assets accounted for 32% of small business loans, defined as loans less than $1 million. In 2009, that percent rose to 37%, although that is off 1% from the prior year. All other asset sized FIs either held their market share or slightly declined. Does access to decision makers, custom loan structures, and better service result in more business? Intuitively it should. So why hasn't it? How do we, as an industry, turn the competitive advantages we have over behemoth banks into real wins in the marketplace? I'd like to hear from you. 2) Might the SBA data also reflect a similar difference in the scope of markets across which community banks compete with large banks? I imagine that the answer to both questions is "some of each," but I'd be very interested in any thoughts you may have on why one explanation may be more dominant than the other. Very good points. When BNY/Mellon charged institutional depositors with very large balances a fee/negative interest to park their money, I was confident there is an institutional component to the large bank deposit inflow. I think it is less so in the small business lending data. 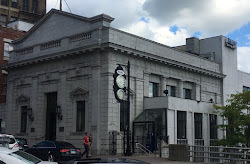 Although many community banks sell SBA loans into the secondary market, and possibly to the largest banks, I do not believe the data set captures this shadow banking activity. If correct, and I believe it is, then larger banks are doing proportionately more small business lending than community banks. Not a positive development, indeed.